I was inspired to create this blog by the folks over at ChooseFI, who have put together an excellent podcast series on achieving financial independence (+/- early retirement). In their talk on creating a blog, they stressed the importance of spending a good amount of time thinking about the name of your blog, making sure it is perfect and marketable, that it is not so specific as to be restrictive, and that it is something you can see yourself being attached to for years. It took me about five minutes to decide on the name you see above. Why was I so confident? First of all, it doesn’t look like anything vulgar or offensive when you spell it out as one word à la URL. More importantly, it summarizes a number of goals that I have in mind as I contemplate my transition into a practicing physician. If you’ve ever taken a psychology course you’ve probably encountered Abraham Maslow and his Hierarchy of Needs. If this framework is foreign to you or you need a refresher, the general gist is that that there is a natural order of ‘goals’ or ‘needs’ that are met in a generally sequential fashion as a conscious being progresses through its life and development. Things like food, sleep, and shelter make up the base of the pyramid, and like friendship, family, and social status make up the upper levels. 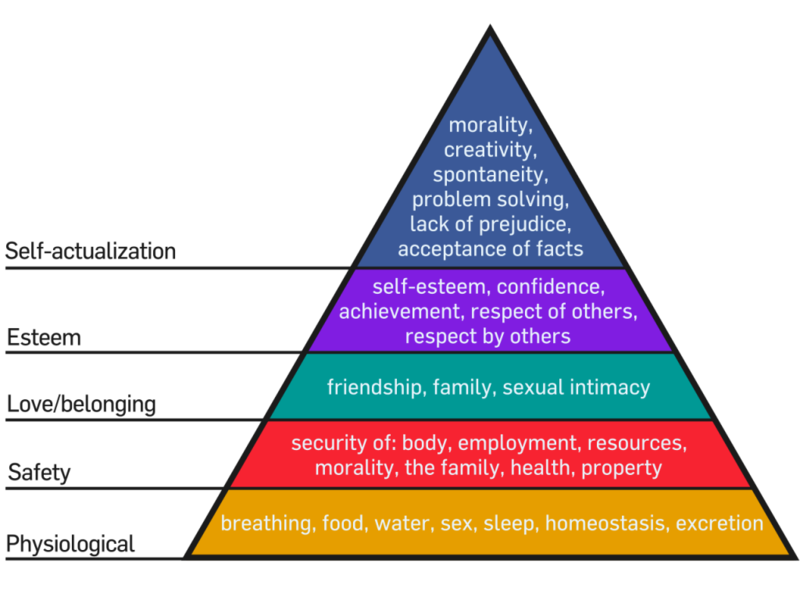 The tip of the pyramid is ‘Self-Actualization”, which has as many definitions as there are psychology professors, but which most would agree generally represents achieving one’s full potential – whatever that means for that individual. This is a very clean framework and and it makes intuitive sense: you’ll never be able to give to others or develop yourself as a person if you don’t have a guaranteed roof over your head and are living day to day (or paycheck to paycheck) in fear of everything falling out from under you. When I think of my (relatively) imminent transition into someone who has the ability to begin working on their debts when I become a grownup and start practicing independently, I imagine something similar. This is pretty self-explanatory. 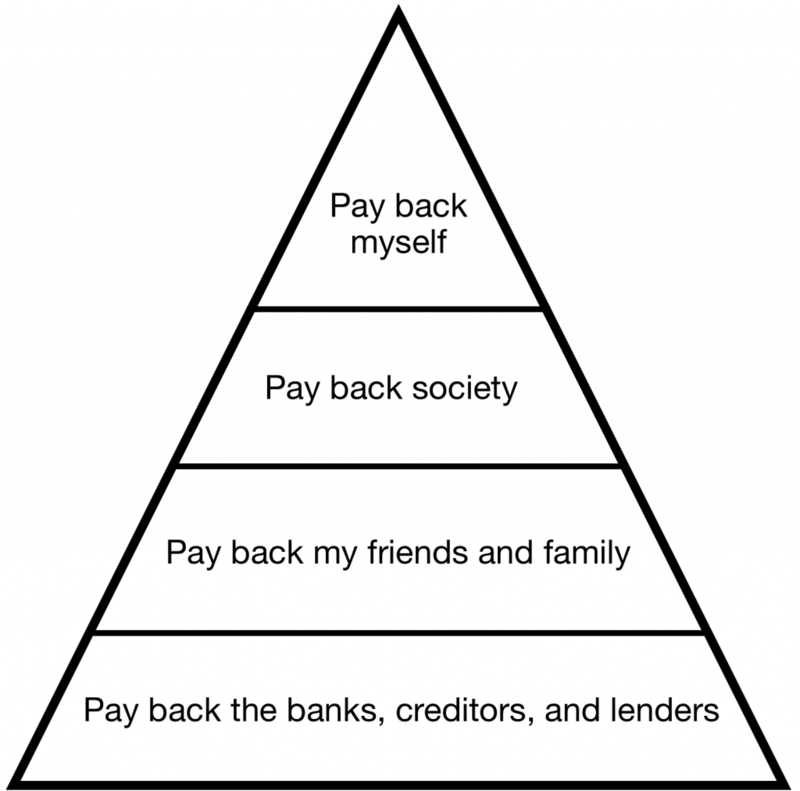 Any path to financial independence has to include a plan for getting rid of monetary debt, whether through forgiveness or old-fashioned repayment. My wife and I have over $200,000 in debt between the two of us, and it is going nowhere fast without a plan for tackling it. I have been sacrificing personal relationships for the better part of 10 years since I started medical school, and this is something that I want to start making up for. I owe so much to my wife, my parents, and my friends for supporting me, keeping me sane, and giving the strength I needed to get through the academic slog that is a modern medical education. I want to start being a better husband, a better father, a better son, and a better friend. As I mentioned in my last post, I didn’t get here on my own. I went to a series of excellent public schools, and I have received my training in country with a stable government and economy, in a community that values education and growth. Charity and advocacy have never been a large part of my life, but they are things that I have benefited greatly from and I hope to return the favor. This is also where the creation of this website falls. I don’t think it’s selfish to note that I have sacrificed a lot for this career as well. I gave up my 20s to studying and working 24-hour shifts for $15/hr. I have sweated and cried for patients, often for people who would never even think of saying thank you. I don’t need anybody’s sympathy – I did choose this – but after so much delayed gratification I think there has to be a bit of a release valve. The trick is not allowing this to slip into runaway lifestyle inflation and the hedonic treadmill, things I hope avoid with all the preparation I will have made for the transition. So that’s Dr PayItBack. I have a lot of debts in my life – money, time, affection – and I want to square the ledger.